The idea of continents that supported ancient, perhaps even cultured and prosperous people, before they sunk under the sea has captivated historians since the days of Plato and even earlier. Made popular by the famous ancient Greek philosopher Plato, Atlantis is perhaps the most widely known, but certainly not the only sunken great landmass. In addition to the legend of Atlantis, there are also legends of other sunken continents, or large landmasses, one called Lemuria and another called Mu. Furthermore, there are others which have already been verified by science: Zealandia, Doggerland, and the Kerguelen Plateau, for example. Perhaps the most famous sunken continent legend, Atlantis has sparked centuries of theories without much verification other than Plato’s stories, titled Tinnaeus and Critias, according to BBC. Plato tells a story of an island; he actually doesn’t use the term continent. Its influence extended into the Mediterranean, past the Pillars of Hercules, which are known today as the Straits of Gibraltar. He said it was larger than Libya and Asia combined. Its kings were descended from Poseidon, god of the sea and earthquakes, according to Plato. Atlantis was a powerful empire and its influence stretched to Italy and Egypt. Following a war with very ancient Greeks, Atlantis was destroyed in one terrible day by earthquakes, volcanic eruptions, and floods, approximately 9,000 years before Plato wrote about it around 360 B.C. Plato documented the origin of the legend in Timaeus. According to Atlantis Quest, Critias learned the story from Solon, a Greek statesman and ancestor of Plato, when Critias visited Egypt about 590 B.C. Apparently, while in Sais, he had learned the legend from Egyptian priests who knew of the lost land. Interestingly, Solon’s quest to Egypt is corroborated in Plutarch’s Solon, written 75 A.C.E. The debate continues over the true location of Altantis. 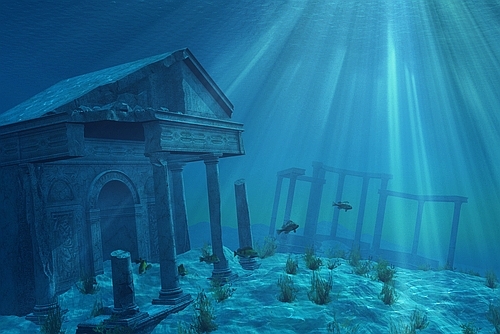 Some theorists claim that land masses off the coast of Crete may have been Atlantis. The latest theory came from physicist Rainer Kühne who claims that Atlantis was a piece of southern Spain destroyed by a flood between 800 and 500 B.C, according to National Geographic. “These satellite photos show rectangular structures and concentric circles that match very well with Plato’s description of the palaces and the city of Atlantis,” said Kühne, according to National Geographic. His research was reported in the journal Antiquity. Another interesting theory comes from Atlantis Quest. The continent might have existed as part of the mid-oceanic Azore Plateau and sunk quite suddenly, due to sea floor subsidence. The interesting part of this theory is the fact that the geologic timetable for the sinking corresponds to the time period Plato described.